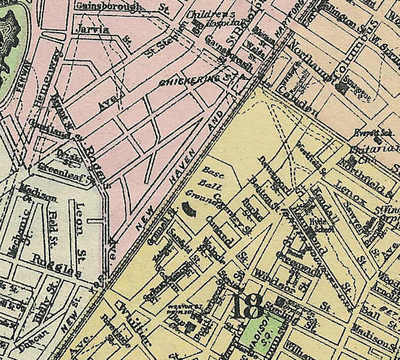 My post on the Congress Street Base Ball Grounds prompted a few emails inquiring about the location of the South End Base Ball Grounds, which can be seen at the center of the map above. A few other notes about this map: it shows Chickering Station, a reminder that the piano factory at that location was large enough to warrant its own railroad station. The Ruggles Street Baptist Church moved to the corner of Park and Beacon, and a number of other streets were lost when Melnea Cass Boulevard was created. The 1902 lithograph below, from the Library of Congress American Memory Collection, shows the area near the South End Grounds looking towards downtown Boston. The Beach and Clarridge manufacturing plant was located at the corner of Columbus Avenue (the street running along the right side of the view) and Camden Street, a few blocks down from the South End Grounds. A detail from the lithograph shows the Huntington Avenue Base Ball Grounds, where the Boston American League team won the first World Series (as the Pilgrims--they didn't become the Red Sox until 1907). At the time of this lithograph, the Boston team was known as the Somersets, after Charles Somerset, the first owner of the franchise. One can also see the Fenway, in a bit of artistic license.